As cities in the United States blossomed during the industrial revolution in the mid-nineteenth century, Americans soon found themselves craving the benefits of nature and the undeveloped environment. Progressives and public officials agreed that citizens living in noisy, overcrowded tenements surrounded by brick and stone, and faced with endless amounts of pollution needed an escape from the drudgery of city living. The result was the birth of the modern public park or an Americanized version of the expertly-manicured English garden. The goal of the urban public park was to preserve and enhance undeveloped space, and to provide the beneficial effects of a natural "wild" environment, while at the same time maintaining order and promoting civilization. Established in 1853, New York's Central Park was one of the nation's first city parks. Considered the father of American landscape architecture, Frederick Law Olmsted meticulously architected the design of Central Park, yet left it "wild" enough to give the visitor a feeling of being close to nature. Soon after, Olmsted's services as a landscape architect were commissioned all over the United States, including Baltimore. His ideas and visions have directly impacted many famous urban parks and the National Park Service. Baltimore's park system began around the same time as the establishment of New York's Central Park during the mid-nineteenth century. As the oldest public park in Baltimore, Patterson Park was originally owned by William Patterson. During the War of 1812, local Baltimoreans joined up with the militia at the site of Patterson Park to defend the city of Baltimore and Washington, D.C. from advancing British troops. In 1827, Patterson donated six acres of his property to the city of Baltimore with the intent that it be made into public recreational space. It became an official city public park in 1853. During the Civil War, the land served as an important military camp and hospital center. 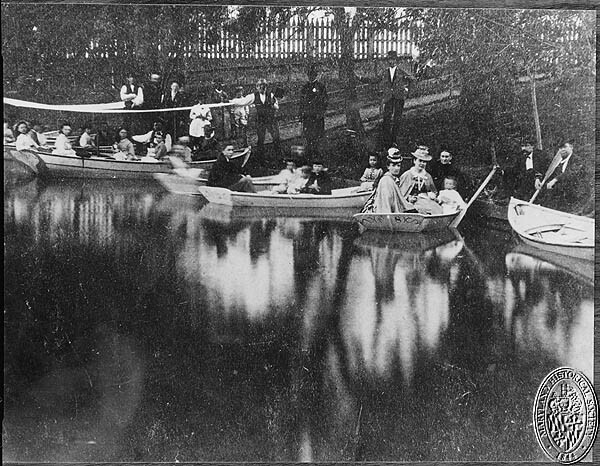 Patterson Park’s acreage was later expanded in 1873, 1883, 1907, and 1913. The later expansions came with the help of the Olmsted Brothers. The park has contained numerous architectural structures, some of which still stand today like the Pagoda (1891). Today, Patterson Park still serves the public as a 137-acre recreational space in the middle of the city. As the second oldest public park in Baltimore, Druid Hill Park is perhaps better known than any other Baltimore park. The area which is now considered Druid Hill Park was once owned primarily by three generations of the Rogers Family. Nicholas Rogers (son of the first Nicholas Rogers who originally purchased the land) developed an interest in landscape architecture when he studied in Glasgow, Scotland during the late eighteenth century. As a veteran of the American Revolution, Nicholas Rogers is known for planting many of the trees in the park and for constructing the original mansion (which was destroyed by fire and later replaced in the early nineteenth century). Rogers died in 1822 freeing all of his slaves and bequeathing most of his land to his only son, Lloyd Nicholas Rogers. Established as an official city park in 1860 when Lloyd Rogers sold most of the land, Druid Hill Park is now on the National Register of Historic Places. Its most well known elements are the man-made Druid Lake, which began construction in 1863, and the Maryland Zoo (previously known as the Baltimore Zoo). Established in 1876, the Zoo received its early animal collections from prominent Baltimoreans who wanted to enhance the experience of nature in the park. Druid Hill Park continues to revitalize the citizens of Baltimore today with its 746 acres. Baltimore’s third municipal park, Carroll Park, was originally part of the enormous Mount Clare estate owned by Charles Carroll, Barrister in the mid-eighteenth century. It also served as a union encampment during the Civil War. Purchased by Baltimore in 1890, Carroll Park’s 170 acres of land now features a golf course, recreational facilities instituted by the Olmsted Brothers, and the original Mt. Clare Mansion constructed in 1756. Materials compiled in this document can be used by educators to fulfill the following National History Standards for Grades 5-12. DESCRIPTION: Map and directory of Camp Patterson Park [Baltimore, Maryland] One Hundred and Tenth Regiment of New York Volunteers. Col. D.C. Littlejohn, commanding By. J.B. Butler, engineer and surveyor. Printed by F. Bourgquin & Co., Philadelphia. September 27, 1862. DATE CREATED/PUBLISHED: [Philadelphia F. Bourquin & Co.], 1862. NOTES from American Memory: Scale 1:360. Reference: LC Civil War Maps (2nd ed. ), 256 Detailed map indicating position of tents, principal buildings, wagon roads, and "earthwork intrenchments of the War of 1812." Tents are keyed by number to a list of occupants printed at the sides and bottom of the map. Includes portraits of nine officers of the regiment. Description derived from published bibliography. REPOSITORY: Library of Congress Geography and Map Division Washington, D.C. DESCRIPTION: Colored lithograph,	Camp Patterson Park. Baltimore, Md. 110th Reg't New York Volunteers, Col. D.C. Littlejohn. DESCRIPTION: Colored lithograph, U.S.A General Hospital, Patterson Park, Baltimore, Md. DESCRIPTION: "The Importance of a Botanical Garden, For the Unimproved Section of Patterson Park: Read Before the East Baltimore Business Men and Old Town Merchant's and Manuf. Associations"
DESCRIPTION: Postcard,	Druid Hill Park - Camel House, Henry Rinn, Jr. DESCRIPTION: "Correspondence in regard to John W. Garrett's present of four camels to Druid Hill Park"
DESCRIPTION: Colored lithograph,	Camp Carroll. Baltimore, Md. The Evolution of the Conservation Movement, 1850-1920. From the Library of Congress, American Memory. Blodgett, Geoffrey. "Frederick Law Olmsted: Landscape Architecture as Conservative Reform." The Journal of American History Vol. 62, No. 4 (Mar., 1976), pp. 869-889. Bowditch, Eden Unger. Baltimore's Historic Parks and Gardens. Charleston, SC: Arcadia Publishers, 2004. Magnus, Becky and Lisa C. Jack, eds. Druid Hill Park Revisited: A Pictorial Essay. Baltimore, MD: Friends of Druid Hill Park, 1985. 410-396-7459 Friends of Patterson Park, Inc.
27 South Patterson Park Ave. This document packet was researched and developed by Sarah Davis.